Five steps to help you keep your New Year’s resolutions in 2013. The following are the posts that I loved writing this year. They’re not necessarily the most read or commented on or likely to be your favorites — they’re simply the ones that rang “best” with me. Enjoy! One of the things I love to do in January is to unsubscribe from unwanted email lists, newsletters, digital sales fliers, and so on. After spending 11 months ignoring them whenever they show up, it’s time to get rid of them entirely. In this post I’ll explain a few ways to purge electronic mail lists from your email inbox, from one-at-a-time to bulk action. It’s my fault for subscribing in the first place, of course. Often when I do, my intentions are good. I’ll find a new site or service that I’m interested in and think, “Yes, I do want to keep up to date with this company’s stuff.” Once I’ve done that a dozen times, I’m in trouble. 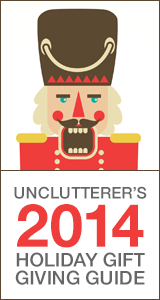 Digital clutter is just as insidious as its real-world counterpart, so it’s time to make a change. I’m not opposed to email subscriptions. There are many that are quite useful (like the Unclutterer email subscriptions, obviously). Therefore, the first step in this process is to identify the ones you’ll get rid of in your purge versus the ones you wish to keep. I do this via a week of mindful email reading. Each day, I’ll make a mental note of the subscriptions I simply delete without reading. If you like, create a folder for these, mark them with a flag or otherwise tag them for future reference. When I did it, I just wrote a list on a piece of paper. Unroll.me. Not only does Unroll.me help you kill unwanted subscriptions, it makes the keepers more manageable by presenting them in a single, daily digest email. You can even roll things like messages from Facebook, Twitter, and YouTube into that single message. Tidy! Mailstrom. This is another service that lets you cull hundreds or thousands of messages at once and send them all to the big, virtual trash bin in the sky, while keeping the messages you want to see intact. Plus, it works with the email solution you’re probably already using, as it’s compatible with Gmail, Google Apps Email, Outlook, Apple, Aol, and Exchange IMAP. A tip for Gmail users. If you’re using Gmail, take a close look at the top of a message. You’ll likely see an “Unsubscribe” link. Google has made this a uniform location for this link, which is great, as it saves you from scouring a message’s footer for the hard-to-find default link. Unlistr. Finally, this is a service that does the dirty work for you. Simply identify the email senders you don’t want to hear from anymore, and Unlistr does the rest, unsubscribing for you. Thanks, Jeeves! Improving fitness and health is a popular New Year’s resolution. And scientists who study such things have found that keeping track of your workouts can help with reaching your goals. Tracking helps you monitor your progress and that is beneficial because increased strength and endurance are often hard to perceive. Also, it is much easier to remember your workouts when you see them rather than trying to remember what exercises you need to do or what weights you need to use. Pen, paper, and notebooks are ideal for recording and monitoring your progress. You can record as date, time, workout description, weight levels, repetitions with as much or as little information as you wish. There is no special technology required and it is very cost effective. However, your notebook may be too bulky to carry with you back and forth to the gym and it may be time consuming to re-write the same information over and over again. It isn’t easy to see the information in a graphical format either, which is why I recommend apps you can access on your smartphone, tablet, or other digital devices. Fitbit is a bracelet that tracks your steps, calories burned, and distance travelled. It syncs with your smartphone and provides a daily report of how active you are. There are several models of bracelets. The most basic models track steps, calories burned, and distance. The more advanced models track heart rate, sleep quality, and have a built in GPS tracking system. With the Fitbit website you can set goals, earn badges for reaching your goals, and connect with other Fitbit users to create a support network. Abvio is a software company that makes three easy-to-use apps for your smartphone that can be used to track your workouts: Cyclemeter, Runmeter, and Walkmeter. All three apps allow you to record splits, intervals, and laps. They also have maps, graphs, announcements, and built-in training plans. These apps will sync with different types of sport watches that monitor heart rates. Cyclemeter can connect to some types of bicycle computers to record cadence as well. Abvio does not have its own website, but the data from the apps can be exported and uploaded into various other social fitness sites. Those who participate in different types of sports such as yoga, martial arts, or horseback riding, may wish to consider The Athlete’s Diary. It is a multisport computer log, available for both computers and smartphones. It has a special-purpose database program designed for athletes and keeps track of the date, sport, category (training, interval, or race), distance, time, pace, route/workout, and has an area for comments. The Athlete’s Diary syncs with your computer and smartphone through Dropbox so you can use either device to enter your fitness data. Virtual Trainer Pro is a really unique app for your smartphone. It is a database of hundreds of exercises, each demonstrated in a video by a fitness expert. You can create your own routines easily by dragging and dropping the exercises into the order you wish to follow or you can use one of thousands of ready-to-use workouts. Tracking your score and earning points and medals will help to keep you motivated. There are many other apps available for monitoring fitness progress. Some are sport specific, others also allow you to track caloric intake and nutritional information. It doesn’t matter if you’re just starting out or you’re a serious fitness pro, being organized and tracking your fitness information will help you to reach your fitness goals. The following suggestions are a few things you can do to keep the post-holiday cleanup stress to a minimum. I can hardly believe it’s near the end of December 2014. For my kids, the weeks and days before Christmas are passing at a snail’s pace. For me, the last 12 months have been the blur of an Indy car race. How are we about to flip the calendar onto another year? Speaking of, where exactly are we? As the new year approaches, many people start thinking about resolutions. I’ve no interest in resolutions. I’ve typically been fueled by reflections on the previous 12 months. And that’s what I’m focused on this year. I’m conducting what I’m calling a personal audit. It starts by asking myself two questions, providing honest answers, and then drawing a plan from the resulting lists. … and so on. When writing this list, I keep going until I can’t think of another thing. It’s important to be honest here and, again, to resist the urge to stop and second guess each item. There will be time to deal with the specifics in a bit. Now, on to the second question, which some of you may have guessed. Once both questions have been answered thoroughly, I move on to step two: categorization. While reviewing the lists, certain groupings become clear: family, finances, health, professional life, travel, learning, and personal organization. These are the areas that saw success, failure, or both. I made these lists because the act of brainstorming and then sorting the results into categories lets me see the areas of life that are important to me. Now, I can make informed goals for next year, as opposed to pie-in-the-sky, out-of-the-blue resolutions like “Be happy.” The following are the goals I’ve created for 2015 based on the personal audit I did of 2014. Financial: Use budget software regularly. I’ve toyed with You Need A Budget in the past, but not consistently. It’s my fault for losing motivation; the software is excellent. This coming year I’ll be back on track. Professional: My podcasts are doing nicely. This year I’d like to expand their reach, and attract/increase sponsorship opportunities. Health: This was hit-and-miss this year. I’ve gotten much healthier than I was six months ago, but there’s still work to do. Getting winded after 15 minutes of kicking a soccer ball around is not fun and honestly, quite embarrassing at 43. This year I’ll continue to eat right, obsess over my Fitbit and increase the amount of walking I do. Personal organization: I’m great at forgetting to do important things. This year I’ll research and adhere to strategies to make myself more successful in this area. I’ll continue in this manner until I’ve addressed all items and categories on my lists. I know what you’re thinking. “Dave, you just created the list of resolutions you denounced at the start of this post.” It can seem that way, but I assure you, I haven’t. It’s all thanks to how I plan to pull off the goals I’ve created. Specifically, I’ll be making projects, actions, and reviews. Define, know, act steps — for each project. If I had nothing else to do in the world but attract podcast sponsors, what’s the first thing I would do? The second? Third? And so on. This is repeated for each project. Next is the good part. If I were to say, “OK, Dave, hop to it. Here’s your 15 projects for 2015. Go be a better you!” I’d fail in no time. So, my final step is to identify what I’m going to work on in January. And then February, March and April, etc. Finally, I set up regular review days and put them into my calendar. I’ll schedule a reminder during the last week of each month to see how I’m doing and make adjustments. In short (too late, I know), I’m treating the result of my personal audit like any other project I’d have to complete for work. “Walk 45 minutes per day” gets the same treatment as “Get the Williams proposal on Mr. Johnson’s desk by Friday.” Actions are defined as well as review dates. Finally, and I didn’t do this but it’s a nice idea, you can create metrics to work toward. You can identify the “amount of money in my savings account” or “number of steps walked in a month.” I lump this in with defining what “done” looks like, but you can certainly use this tactic if you want. I suggest sitting down when you have some quiet time and performing a personal audit. Be completely honest and nonjudgmental with yourself. Organize the results and set clearly-defined, attainable goals from there, as well as regular review periods. Finally, if you’re unhappy with how it’s going, make adjustments. There’s no shame or failure in being proactive and taking steps to make something work for you. Here’s to a fantastic 2015. I hope you all achieve your goals. Command poster strip value packs are great for kids and students who love to stick photos and posters to the walls. Command picture hanging strips are great for heavier pictures. The black ones are ideal for dark coloured picture frames. Command decorative wall hooks can be used to hang coats or towels and the mini wire hooks can be used to hang keys or kitchen utensils. Colourful Velcro cable ties are great for keeping cables behind computers or sound systems in order. They also can be used to keep the electrical cords of small appliances from getting tangled in the kitchen cupboards. A lipstick sized portable battery can give your phone or camera an extra bit of charge while you’re out touring the town. This is a must for those who use their phone as a GPS or teens who text constantly. 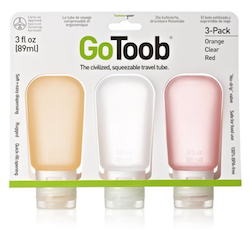 GoToob travel bottles (pictured above) are approved for airplane carryon baggage. They have a wide opening so they can be filled easily and are made from silicone so you can squeeze them until you get every last drop out. Consider using them to unclutter your home shower and then store the mega-bottle of shampoo in the closet. Rubbermaid’s mini food storage containers are ideal for storing spice mixes, sauces, and dips. They are also perfect for preparing portion-sized snacks in lunch boxes. Handle holder hooks will keep brooms, mops, and garden tools organized and they will also work with ski poles, hockey sticks and other sports gear. A 5-Pockets Coupon and Personal Check Size Expanding File can be used for organizing receipts and business cards from business trips, coupons, postage stamps, or collectors cards (e.g. Pokemon). Labels of all sorts make great stocking stuffers. Check out our past post on an in-depth look at labels to find the perfect gift. If you’re being tortured and what stands between you and death is knowing how many eggs you have in your refrigerator, you’ll get to live if you happen to own the Egg Minder Internet Connected Tray. In the midst of Hanukkah and nudging ever closer to Christmas, I thought it might be helpful to repost our Unclutterer Holiday Gift Giving Guide for last-minute inspiration for those who celebrate during this season. Then, on Monday, Jacki will have a post about stocking stuffers to give you even more organized and uncluttered gift-giving ideas. I still have a few more people on my list to shop for, so I definitely need to scour through these posts to spur my creativity. I wish everyone happiness, good health, and organized and uncluttered living the next couple weeks. On Unclutterer, we’ve written about how to prepare for a trip, with packing lists and more. But professional organizer Julie Bestry and I were recently discussing a related concern: How do you end your trip in an organized manner? The following are some suggestions that might work for you. You may choose to keep some items in your luggage permanently — a toiletry case or a spare charger, for example — especially if you travel a lot. Beside these items, unpack everything else right away, being sure to look in all the pockets of your luggage. Earlier this year, I thought I’d lost my favorite business card holder when it was actually just hidden in my luggage. Finding it when I packed for a recent trip was a pleasant surprise, but it would have been even nicer to have not misplaced it for six months. Did you use up your travel-size toothpaste, or something similar? Make a note on your to-do list to replace depleted items. Another example: On my latest trip, I realized the wheels on my suitcase squeak quite horribly. Getting that fixed is going onto my to-do list now. Other things can be worth noting, too. For example, I’ve learned things about rental cars that I’ve put into a file (and others might choose to put into Evernote) for future reference: which models of cars I’ve liked and disliked, what things to make sure I understand about any car before I drive away from the rental office, etc. (I once had a car which hid the headlight controls in an unusual place, and it took pulling off the road and doing some searching to find them.) This is a file I might well want to update after any trip that involves a rental car. If you had a notably good or bad experience, you may want to write a review for a site like TripAdvisor. If that’s something you want to do, it’s best to do the writing while your memories are still fresh. It’s easy to believe we’ll never forget where we were when we took our photos, but all too often, we do forget detailed information. Name the photos or tag them while your memory is fresh. And while you’re doing that, take a few moments to delete the photos that just aren’t worth keeping: out-of-focus photos, duplicate shots, etc. If you were hosted by friends or business associates, take the time to write thank-you notes expressing your gratitude for their hospitality. If you use an email auto-responder, remember to cancel it. I’ve received numerous messages telling me someone was out of the office until a specific date, many days after the date in question. Similarly, if you customize your voicemail greeting while you’re gone, remember to change it once you’ve returned.